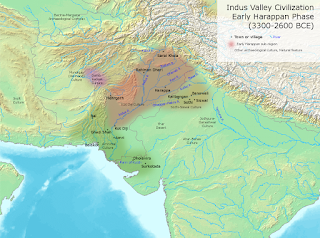 The earliest city discovered in the Indian sub-continent was Harappa on the river Ravi. Further down the Indus valley another ancient city was excavated and this was Mohenjo-daro in Sind. 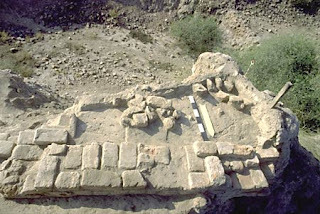 The archaeologists called this ‘Indus Civilization’, because both these sites and other sites sharing the same culture that were found in the Indus valley. 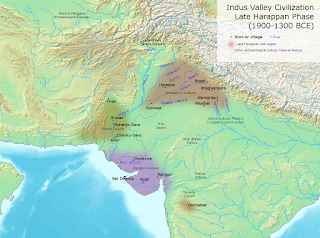 The Indus Valley civilization is also called the Harappa culture since the pattern of living in these cities resembles that of Harappa. At that time the northern and western parts of India were covered with forests. The climate was moist and humid and Sind & Rajasthan were not desert areas as they are today. This culture was spread over parts of the Baluchistan, Sind, Punjab (east and west), Haryana, Western U.P., Jammu, Northern Rajasthan, Gujarat and Northern Maharashtra. Generally, it is thought that, the civilization started developing around 4500 B.C. but reached its peak around 2500 B.C. and lasted at its peak for about 1000 years. It started declining by 1500 B.C. The upper city was built on raised platforms and has been described as citadel. This part included the public buildings, the granaries, the more important workshops and the religious buildings. The other parts of the city, which was much larger i.e. the lower part where the people lived and carried on their professional work. If the city was attacked or threatened by floods, the inhabitants of the lower city probably found refuge in the citadel. In the citadel of Harappa, the storage buildings were neatly laid out in rectangles and lay close to the river. Goods were brought in boats along the river for keeping stored. Granaries have also been found at Harappa, Lothal and Kalibangan. Nearby were the furnaces where the metal-workers produced a variety of objects in metals, particularly copper and Bronze. The potters also worked in this part and the laborers all lived together near this area in small quarters. The bigger houses had a courtyard, a private well, toilets and many rooms. The smaller houses had only a few rooms with toilets and bathrooms. Another building nearby was either a meeting hall or a market place. The great bath at Mohenjo-daro was used for religious purposes. The lower city of Mohenjo-daro was carefully planned before the houses were built. Streets were quite straight. They cut each other at right angles. This plan divided the city into large rectangular blocks. The houses were built on both sides of the street. Brick, wood, and stone were used for making buildings. Walls were plastered and colored. The roofs were flat. There were few windows but plenty of doors which were probably made of wood. The kitchen had a fireplace and large jars of pottery for storing grain or oil. Cities also show excellent arrangements for sanitation. Each house had a bathroom connected to a drain. These small house drains were connected to the covered street drains. The street drain ran along the sides of the street. In the house there was a courtyard which had an oven for baking bread, and the housewife sat here to grind her spices with a pestle and mortar. Perhaps domestic animals, such as dogs, cows and goats were also kept in the courtyard. Some houses had their own wells. These houses probably belonged to merchants and those who were well off. There were other people who worked as laborers lived in a small, one-room quarters. There was a large building at Mohenjo-daro which appears to have been a palace or the house of a governor. Historians are not certain whether the people of Harappa had a king or whether they were ruled by a committee of citizens. The houses excavated at these cities suggest that there were probably at least three distinct social groups. (i) People who ruled and they seemed to live in the citadel area, (ii) Rich merchants and others who lived in the lower city, (iii) Poor laborers. In addition to these groups in the town, there were also the cultivators in the surrounding areas who produced foods for the cities. There is also evidence of pastorals who lived and moved in the countryside and were very active. Plough field discovered at Kalibangan shows that their cultivation pattern was same as today. The land was fertile and barley and wheat seem to have been widely grown. Other Crops like mustard, sesame, cotton, and millet were also grown. Though fields were ploughed, the produce was large. For irrigation of fields, channels of water may have been taken from the rivers. They were the earliest people to grow cotton. (Since the Greeks learned about cotton from Indians, they called it Sindon after the river Sindhu i.e. Indus) They like fruits particularly bananas and pomegranates. They also ate meat and fish. The people of Harappa had animals like dogs, sheep, goat, oxen, buffaloes, camels, elephants and pigs. The presence of the horse is also indicated by Terracotta figurines and bones. The main items of trade were tin, copper, gold, timber, silver and precious stones. The people of Harappa used standard weights and measures for their transactions. They sent cloths to the towns along the coast of the Persian Gulf and to Sumer. The merchandise was shipped from Lothal, where a dockyard has been excavated. There were also trade contacts with people of northern Afghanistan from where the people of Harappa brought the famous blue gemstone, lapis lazuli. Finding of clay spindles suggests that many of the women must have spun yarn at home. Women wore a shirt skirt which was held at the waist by a girdle. Men wrapped long pieces of cloth around themselves. The clothes were of cotton, though some wool was used. The women enjoyed dressing their hair in various ways, which they then decorated with combs. The men wore amulets and the women wore bracelets and necklaces. These were made of beads of quartz and shell and for the rich, of gold and silver. For the children there were toys: small clay carts resemblance of the modern ekkas, which were copies of the carts drawn by oxen in which people traveled; Figures of animals which were made like puppets so that their limbs could be moved by pulling a string; whistles made in the form of birds and rattles of all kinds. Marbles were also popular with children. For girls there were dolls too. The older people enjoyed gambling. Terracotta figurines of women have been associated with worship of mother goddesses. The pipal tree was worshiped and revered by the people of Harappa, which is often shown on the seals. Humped bulls and elephants were also worshiped. The seal of a deity sitting in a yogic posture surrounded by animals has been identified with god Pasupati which is another name of shiva. These people also worshiped Shiva in the form of linga. Some of the people of Harappa buried their dead in graves, others practiced urn-burial. They must have believed that there was life somewhere even after death because the graves often contained household pottery, ornaments and mirrors, which may have belonged to the dead person and which, it was thought, he or she might need after death. They used tools and implements made of stone, copper, and bronze. They practiced other crafts also like working in stones, making beads, ivory carving, terracotta images and bangles, manufacture of seals, weaving and spinning, shell working, etc. Brick manufacturing was an important craft. The wheel was used to make pottery. Most of the pottery of this time was of a reddish color and on it were painted designs in black-lines, dots, geometrical designs, tree and leaf designs and animal figure. The famous stone statue of the Yogi and the Bronze figure of a dancing girl from Mohenjo-daro are fine examples of Harappa art. Seals usually made of a steatite, a soft stone. Seals had designs on them which include a variety of animals, trees, humans etc. Above the figure on the seal is the script of the people of Harappa. Seals were perhaps associated with trade. Seals and small objects made at Mohenjo-daro have been found at sites in Iraq. The most frequently portrayed animal on the seal is bull. Picture of boat is found on seals also. The people of Harappa knew the art of writing and their language was written in picture like signs called ‘Pictographs’. Unfortunately, historians have not yet been able to read and understand these pictographs. So in the field of art and architecture Harappans were great builders, skilled in town planning. The houses with the various facilities, the granaries, the great bath show how skillful and efficient the people were in construction. The terracotta and stone images, the bronze figure of the dancing girl and the artistic seals reveal the exquisite workmanship of the artists. The Indus civilization declined over a period of several hundred years in different areas due to different reasons. In Indus River area, it may be declined due to the regular floods in the rivers. While in the Saraswati River area it may be declined due to the scarcity of water caused by the shifting of some of the river channels and so on. The climate also began to change and the region became more and more dry and like a desert. There may have been an epidemic or some disease which killed people. There may have been conflicts between the people of the cities and those living in villages. Since the cities got their wealth from trade, it is possible that if the trade declined the cities would also decline. The cities may have been attacked and the inhabitants unable to defend themselves. Though some aspects of the Harappa culture continued, those who succeeded the people of Harappa knew nothing of city life. So after its decline, India did not have cities for about a thousand years. However, all that this civilization had built was not forgotten and many of its features became a part of the Indian culture in the subsequent years. Cities like Harappa, Mohenjodaro, Kalibangan, Dholavira, and Lothal slowly declined. 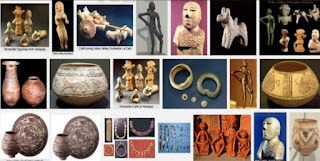 It seems that a major population of the Harappa civilization moved to other areas like Gujarat, northern region of Punjab and Haryana and western Uttar Pradesh.